In Australia it is an obligation under Workplace health and safety laws, for an employer to provide a safe environment. Each state has different obligations and requirements for the employer to adhere to. For the purposes of an example, we are going to discuss the safety equipment to be provided by the employer of a tree looping business, as part of the occupational health and safety requirements. The Australian Safety and Compensation Council (ASCC) leads national efforts to prevent workplace deaths. The ASCC seeks to influence and raise awareness w2ith a role to improving workplace safety and (OHS) performance on a national basis. The placement and need for the appropriate qualifications and licences for all workers in a high risk environment (Tree Lopping) has been legislated as a minimum requirement to the practice of carrying out safe work practices. Many licences are issued for life, unless they have been lost or destroyed. Once an operator is issued with a licence they are now fully covered by the governing bodies in the event of a workplace accident. More info from Safe Work Australia. Here is a list of some of the equipment that must be supplied by the employer. Head Protection or Safety Helmet. A hard hat must be provided by the employer that meets all of the requirements of the Australian Safety Standards. Further more the employee must wear the helmet at all times when carrying out any work duties on the work site. If the employee does not meet this requirement then insurances and work cover could be void. 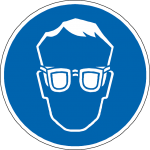 A standard set of certified safety glasses must be issued to the employee, and must be replaced if damaged or lost. By law the employee is not entitled to workers compensation if they have worn a set of safety glasses that do not meet the safety requirements. It is up to the employer to enforce this as a mandatory code of behaviour. Due to the constant noise of chainsaws and wood chippers at a tree removal site, it is essential for the employer to ensure that adequate ear or hearing protection is available to all workers on the site. Permanent loss of hearing can occur as a result of long term exposure to sounds over a specified level of 85 decibels. Most of the machinery used by a tree worker will exceed that level. If the worker is a sub contractor working under their own ABN, then the responsibility for OHS lays with them. The sub-contractor is liable for their own insurances and work cover obligations. All of these requirement are governed under civil law.